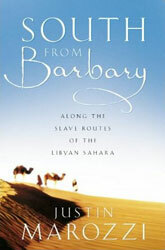 Setting off from Tripoli, Justin and his travelling companion Ned headed first to the ancient oasis and former slave market of Ghadames on an improbable mission to purchase five camels and find a guide willing to forego the comfort of a four-wheel drive for the privations of an extended camel trek. The caravan of two explorers, five faithful camels and a series of idiosyncratic Touareg and Tubbu guides undertook a gruelling journey across some of the most inhospitable territory on earth, overcoming threats from Libyan officialdom and enduring the ancient, natural hardships of the desert. 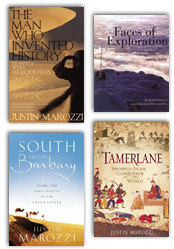 More than a travelogue, South from Barbary is a fascinating history of Saharan exploration and efforts by early British explorers to suppress the African slave trade, which many regarded as “the most gigantic system of wickedness the world ever saw”. It evokes the poetry and solitude of the desert, the misery of the slave trade in action, the companionship of man and beast, the plight of a benighted nation and the humour and generosity of its resilient people.